So you're interested in living simply, right? 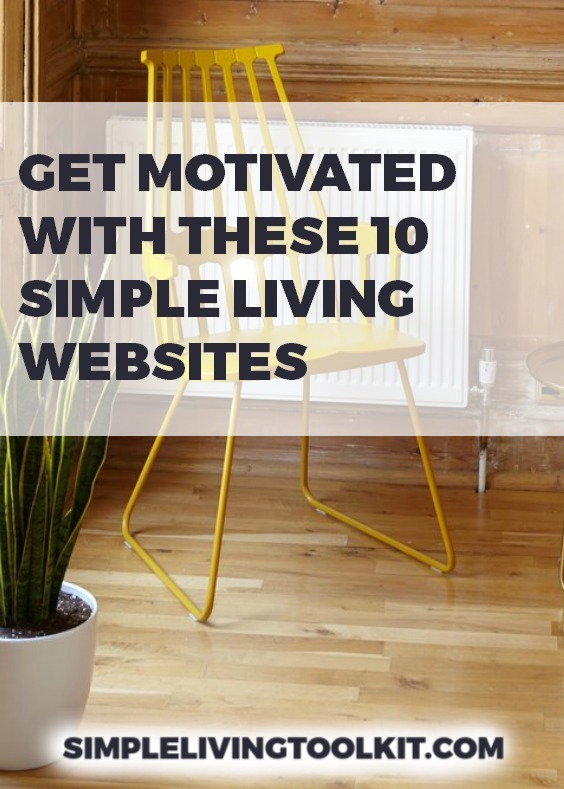 These websites all help you live a more simple or minimalist lifestyle. The list is heavy on inspiration, rather than tools, because I believe if you feel inspired, the right tools tend to come to you easily. I hope you enjoy these sites as I have. Joshua Becker helps guide one million readers with a humble voice and an encouraging attitude. He writes that the blog "quickly became a place to encourage others, the word 'becoming' representing an open invitation to all. It does not boldly require anyone to 'be' minimalist overnight – nor does it specifically define the word for you. Instead, it encourages you to consider the journey and the far-reaching benefits that come from owning less." Courtney Carver is an Oprah Magazine featured motivator. She gently guides readers on "mini-missions, " like "One In Two Out," that help make living simply achievable. Why listen to her advice? She says because she has "made all the mistakes. I have made a bunch of money and spent even more. I have been too busy, too tired, too full, too stressed and too overworked for too long and I’ve changed my ways." I love this site and I use it almost every single morning. It helps me clear my head and do the internal/mindset work that keeps me from using shopping (or eating, drinking, drugs… etc.) to make me feel better when my heart is blue or my mind is confused. I love to journal, get ideas, dream, and even track my daily word count here. The Minimalists, (Joshua Fields Millburn and Ryan Nicodemus) may have been my very first introduction to the online minimalism community. Through them, I realized that there were lots of people like me, who just weren't buying into the whole, well, buying thing. At least not the consuming-as-a-lifestyle thing. I love how they manage to fit both of their (very different) personalities into their blog posts. podcasts, books, and tv show. Uniquely, they tend to get a bit more philosophical and spiritual about decluttering than other simplicity/minimalist bloggers. Author and blogger Francine Jay is a celebrity in the world of minimalist living. She has sold over 150,000 books and been featured on CNN, BBC, and NBC. To me, she stands out in the sea of minimalists online because she cares about fashion and beautiful design. I love her "Real Life Minimalist" series where she profiles her readers in their own words. I chuckle at myself when I realize why Pinterest helps me live simply. It's because in Pinterest Fantasy World, I can have anything I want. One of the cornerstones of living with less stuff is halting all shopping-as-entertainment. Every item I buy is carefully considered, with few whim purchases. Before Pinterest, I missed the visually enticing experience of shopping. But now? Why go shopping in the real world, when you can have it instantly on Pinterest without leaving the comfort of your home? Instead of buying, just pin it. Dana White takes a very playful approach to sharing about cleaning, organizing, and decluttering on her blog and podcast. She’s the author of two books, including her most recent book Decluttering at the Speed of Life. “Looking for perfection?” she writes. “You won’t find it here.” Instead you’ll find reality-based cleaning and organizing strategies. And now for something a little different! Bea Johnson is a celebrated author, speaker, and lifestyle expert. She and her family of four have reduced their annual waste down to what can fit in a small jar. While simple living can be said to encompass zero waste living, I’m very, very far from a zero waste life. However, I find the possibilities inspiring. We can all learn how to move, bit-by-bit, in a zero waste direction. This one is possibly my favorite simplicity blog, if I had to pick. There's a reason ZenHabits is one of the top 50 websites in the world, according to Time Magazine. Writer, runner, vegan, and father of six Leo Babauta writes for two million monthly readers about how to build habits for a peaceful, healthy, simple life. He sounds like a superhero, but if you read his work, you get the feeling he's a regular guy who has slowly and steadily made healthy changes in his life. The website is the most simple and tranquil I've ever visited. Well, you’re here already so I don’t feel like I have to extol the virtues of my own blog. My mission here is to help you simplify to live your best life. I’ve been writing on this topic for over six years and my book has been downloaded nearly (SO CLOSE) 100,000 times on Amazon Kindle. I try my best to mix the philosophical (i.e., why we choose simple living) with the practical (i.e., the t-shirt that should be in your capsule wardrobe).